The best writers are also readers. There is nothing better than reading along in a well written novel and finding an allusion to another piece of great literature. It makes me feel like a member of a secret club. Teachers will call it a text-to-text connection-I simply call it cool! Miller and I are reading, S.E. 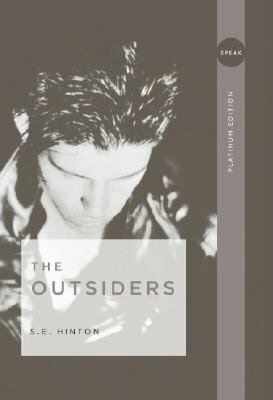 Hinton's, The Outsiders. We are both finding some of the slang difficult to navigate. As an example, the characters are regularly stating the fact that they need "a weed." This is a cigarette, apparently, but that took some time to figure out. This compelling tale, told by 14 year old Ponyboy, has absolutely captured our attention. The tragic incidences of the boys' lives make it hard to read, but the lessons are great. Yesterday, we came across the sentence, "he smiled like a chessy cat." Miller asked, "It that some more slang I don't understand?" I answered, "Perhaps, but why not take another look and see if you can understand the phrase." "I guess it could be slang for a big smile like the Cheshire Cat." And just like that, this dedicated reader had broken the code and was admitted to the secret club. Here, Hinton had given a nod to the great Lewis Carroll and his classic Alice in Wonderland. If you just quickly read the dialogue,you would understand the plot, if not the sentence. But this reader, not only came to understand the reference, he developed a deeper connection to the author. Can you think of a great allusion you have come across that made you think to yourself-Cool?